It could take days for investigators to clear the scene after a deadly standoff in Manchester, New Hampshire. 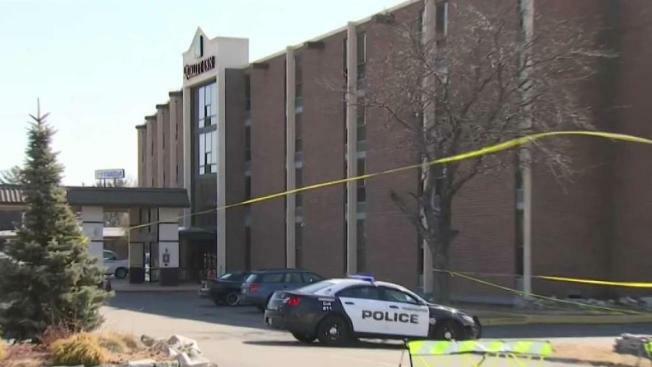 Two people were found dead inside a hotel room after a nearly 15-hourslong barricade situation in Manchester that started with the fatal police-involved shooting of another man, according to the New Hampshire attorney general's office. The barricade started Wednesday evening at the Quality Inn Manchester Airport hotel and lasted until just after 10 a.m. Thursday, after a man was fatally shot by authorities when he allegedly opened fire on them. SWAT teams worked through the night to get two remaining people to come out of the hotel room, including using chemical agents, as at least one individual repeatedly shot at law enforcement agents for more than nine hours. 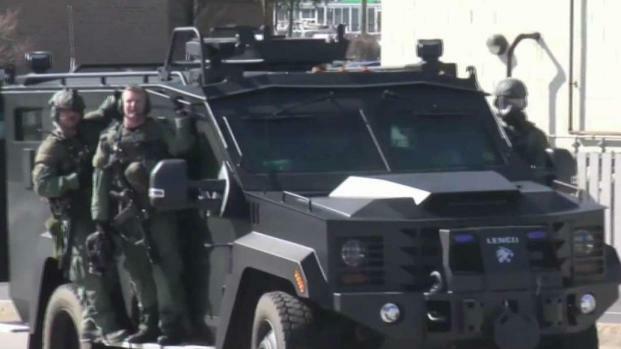 The Nashua police SWAT team were assisting Manchester police, and shortly after 10 a.m. Thursday they entered the first-floor hotel room and found a man and woman, dead, according to New Hampshire Attorney General Gordon MacDonald. They have not been publicly identified. The man who was killed on Wednesday has been identified as 51-year-old Manchester resident Stephen Marshall, officials said in a press conference on Thursday afternoon. 3 suspects are dead following a standoff and shootout with police at a Manchester, New Hampshire hotel. "At the same general time that the police approached the first-floor room in the hotel where Stephen Marshall and the other male were staying, Marshall exited the hotel room via a west facing window," said MacDonald. "Once outside, Mr. Marshall engaged two U.S. drug enforcement administration agents and one Manchester police officer." MacDonald said Marshall had a silver, semi-automatic handgun in his hand when a Manchester police officer and a Drug Enforcement Administration agent opened fire near the back of the John E. Devine Drive hotel at about 7:30 p.m. Wednesday. "Mr. Marshall was struck by gunfire, taken to the hospital where he was pronounced dead," said MacDonald. An autopsy is scheduled for Thursday, according to officials. Authorities did not release the names of the officer and DEA agent involved in the shooting pending the investigation but did say the officer was placed on administrative leave until further notice. Crisis negotiators were initially successful in communicating with the barricade suspects several times, but the communication stopped around midnight. Police first received a call of shots fired in the hotel at about 7:30 p.m. Wednesday. "We heard six to eight gunshots," said Chris Jones. "Within, I don't know, a minute, minute and a half, we saw about 15 Manchester PD (cruisers) come flying in." All hotel guests and employees vacated the hotel by 10:15 p.m., according to police. "I opened up the door to a surprise to have officers in front of me and they just said, 'we need to get you out of here,'" explained John Ridgley who was staying at the hotel. By 10:45 p.m., police said an individual had fired multiple rounds toward officers who were positioned outside of a room. "I came down, there was a SWAT team. I've been up in my room two or three times, and the last time, they said I couldn't go back in my room," James LaCroix, a guest, said. At approximately 3 a.m., the subjects opened fire for about 20 minutes as SWAT team members deployed a chemical agent into a hotel room, according to police. The Manchester Police SWAT Team, state police and the Manchester Fire Department have been assisting police with the standoff. "We cannot and will not tolerate when we have officers being shot at in an investigation like this," Manchester Police Chief Carlo Capano said. No law enforcement agents involved in the barricade were injured, authorities said. The area was closed to traffic, with closures on John E. Devine Drive, South Willow Street and March Avenue. Marshall had an extensive criminal history, with most of the charges involving drugs, according to records obtained by the New Hampshire attorney general's office. The investigation into the hourslong standoff is ongoing, and authorities say investigators will be at the Quality Inn for several days.